Every year we brew a Traverse Ale in honor of the Bellingham Traverse, which is an annual multi-sport event celebrating the life cycle of wild salmon and the natural and urban challenges of their journey. Solo, tandem and relay teams challenge themselves and one another on a rugged course that highlights the City of Bellingham’s Parks, Greenways System, bike-friendly roads, and open water opportunities for recreation. So, we thought, why not challenge ourselves this year, too? We decided to forgo the heavier, maltier Traverse Ale recipes in our past and came up with a new recipe for this year’s Traverse Ale – a Red IPA that drinks like a summer beer with a little extra kick of hops! Red IPA’s are still an emerging sub category of the more general beer style of IPA or India Pale Ale. The exact definition of a Red IPA is still a bit ambiguous and open to interpretation, but, generally, it’s an American Red Ale (or American Amber Ale) style brewed at a higher strength and hopped like an IPA. American Red Ales are traditionally a sweeter, hoppy beer with rich flavor; a style particularly popular here on the West Coast and especially way up here in the Pacific Northwest! 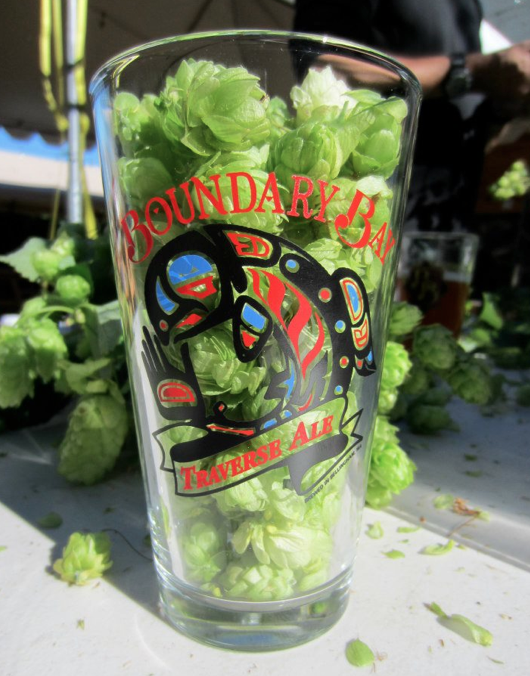 And since we’re known for our signature Northwest IPA, (or so says Sunset Magazine in their September 2013 issue! Have you seen it yet?!) which is one of our flagship beers, we wanted to bring some of that citrusy, hoppy goodness to our Traverse Ale / Red IPA. This new Red IPA of ours has a generous amount of Pale 2-Row, Carafa and Cara Red malts that give this ale a big, malty body with a deep ruby red color. But, don’t be fooled! We add Columbus, Tradition, Centennial, Cascade and Willamette hops to provide a smooth, refreshing counterpart to all those malts. This year’s Traverse Ale is a lighter bodied, yet heavily dry-hopped Red IPA with a distinct flavor and easy drinking quality. It’s on tap now, so come in, give it a try and tell us what you think! Look for our commemorative stainless steel pint glasses with the Traverse logo on them too! Coming soon!! This entry was posted in Beer and tagged Bellingham, Bellingham beer, Bellingham Traverse, Bellingham Washington, Boundary Bay, Boundary Bay Brewery, hoppy beer, IPA, Pacific Northwest beer, Pacific Northwest IPA, Red IPA, seasonal beer, Sunset magazine, Traverse, Traverse Ale, Washington Beer, Washington breweries. Bookmark the permalink.